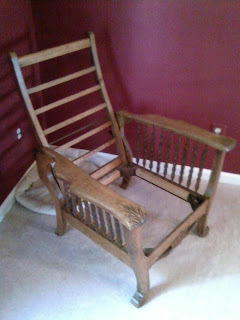 One of the pieces I am currently working on is a Morris chair. This is named for designer William Morris. Below is a link to the wikipedia entry on William Morris and the Morris chair. 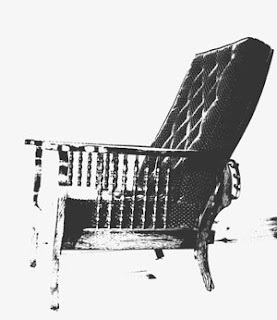 The heyday of the Morris chair was between 1890 and 1920 as it took its place as the recliner of it's day. There were many made and sold during this time, and a quick search of google images will show the diversity of designs that furniture makers employed. 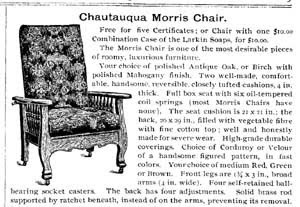 Below is an add for a Morris chair from this period. Because of the construction methods and the overall design of this piece, I would say that the Morris chair I am working on was made between the years of 1890-1920. It is made of quarter sawn oak and has machined carvings. 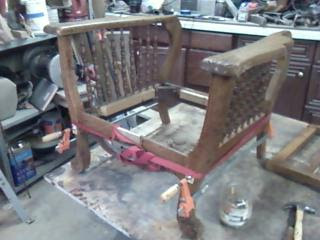 Besides restoration of the finish, this chair was in need of gluing and other repairs. The customer and I decided to replace the hardware because one of the brackets that holds up the back was broken and the rod that holds up the back had been replaced by a steel rod from a hardware store. 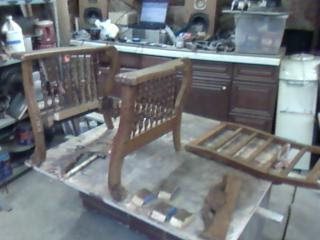 below are some photos of the chair disassembled and glued. I am looking forward to watching the chair return to it's original beauty. Thank you for providing so much history.